This interface cable is designed for environments where you need a headset with push-to-talk functionaliy but don't want to use the wireless based CA12CD. 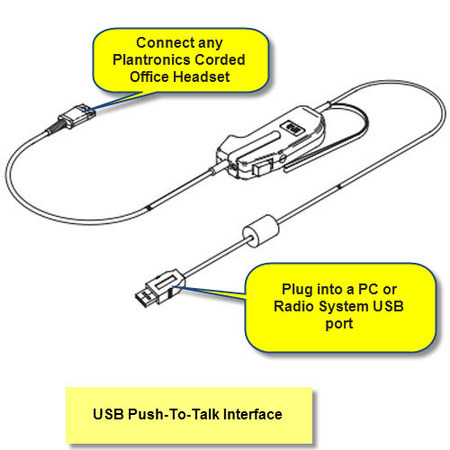 This is a USB PTT bottom cable suitable for any Plantronics headset that has a Quick Disconnect connector. Used with training simulators,VoIP communications and speech recognition - anywhere that high quality USB audio with push-to-talk switching is required. User comfort guaranteed by adding any one of a wide range of Plantronics office headsets.